The following table outlines the process and timings relating to applications to work on or near our network. Applicant submits a Network Access Application online through the Go2Asset website. ~10 days to process from receipt of properly made application. If the request involves network isolation, a Network Isolation Plan will be prepared and approved prior to the issue of the Network Access Permit. We will endeavour to complete all isolation requests within 15 working days of request. Depending on the complexity of the works, some plans may take longer to complete. Applicant receives a Network Access Permit together with the Network Isolation Plan (if applicable). Upon completion of works (on the day of work and prior to leaving site), the applicant must contact the Queensland Urban Utilities Control Room by calling 3856 7179 to advise of completion of works. Applicant must also scan and attach to the Network Access Permit the completed and signed Isolation Plan. Each step in the document must be signed and dated. For general enquiries, please call us on 13 26 57 (7am-7pm weekdays). 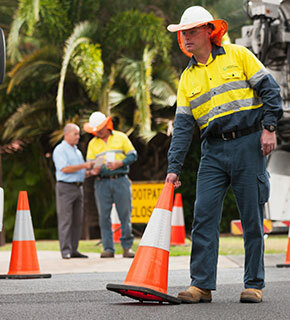 For technical assistance, our Network Access Team is here to assist you between 8:30am-4:30pm weekdays by calling 07 3856 7033.Outside these hours please contact the Queensland Urban Utilities Control Room on 07 3856 7179.